These plates are used for the detection of both yeast and bacterial contamination found in your brew. Quadrant 1: Lin’s Cupric Sulfate Media (LCSM) detects non-Saccharomyces wild yeast and inhibits the growth of brewer’s yeast. 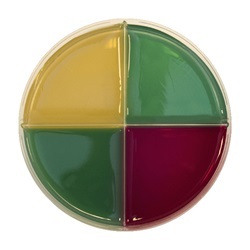 Quadrant 2: Lee’s Multi-Differential Agar (LMDA) detects bacteria and yeast contamination. LMDA detects lactic acid producing bacteria including Lactobacillus and Acetobacter species, which produce acids that change the media color from green to yellow. Quadrant 3: Lin’s Wild Yeast Media (LWYM) detects all wild yeast including wild Saccharomyces strains and inhibits brewer’s yeast. Quadrant 4: Wallerstein Nutrient Media (WLN) is non-selective and detects all wild yeast, pitching yeast and some bacterial strains that are common brew contaminants.